Another diversion from latch hooking is how to make tufted rugs using a sewing machine. 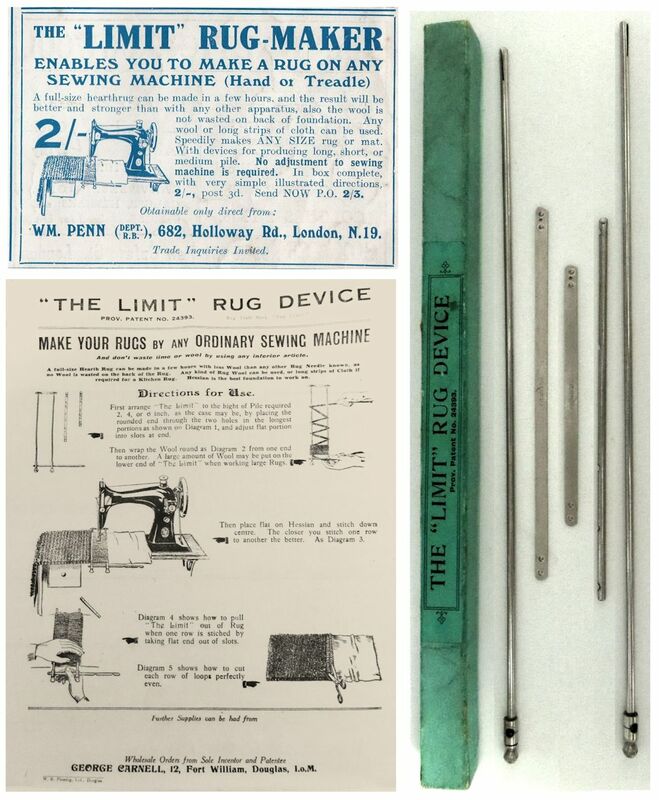 Sewing machine accessories were advertised in some rug-making booklets as an alternative to conventional rug-hooking. I bought one out of curiosity and might give it a try with my trusty old Singer sewing machine and a length of hessian that was bundled with a job lot of latch-hooking supplies. 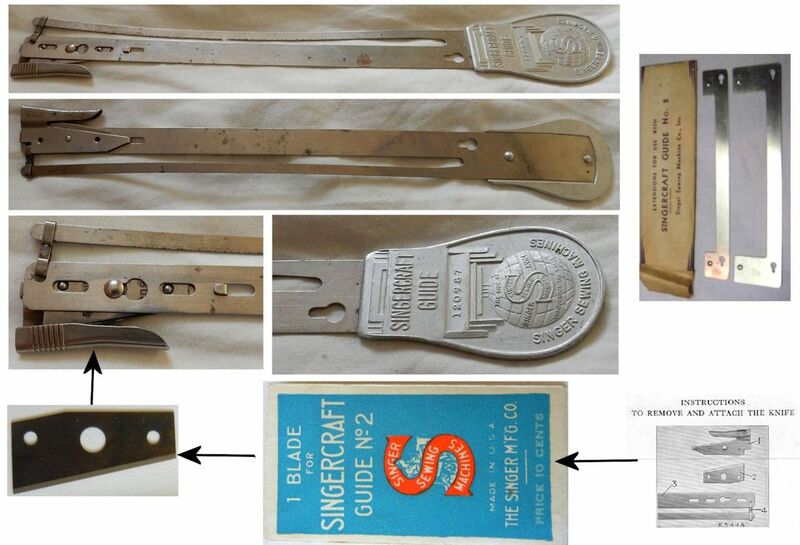 Singercraft guides were manufactured and sold between the late 1920s to the early 1950s and resembled long metal rulers with a slit along the length, closer to one edge than to the other. Although my interest is cut-pile rugs, these accessories were also used to make loop-pile rugs and all sorts of fancy looped and tufted trims for clothing and soft furnishing. Width extensions allowed the strand/loop length to be changed. Moving away from yarn, you could use strips of cloth and make rag-rugs, or strips of twine to make doormats. Similar guides included “The Limit Rugmaking Device” for sewing machines, and I’ve seen home-made versions. Some home-made versions were U-shaped pieces of thin wood, where one arm of the U was wider than the other; the width wasn’t adjustable so you needed several wooden guides if you wanted different length strands. Singercraft guide 120936 (late 1920s) was the first model and the simplest in design; a button at one end kept the guide at an even width. Singercraft guide 120987 replaced the width button with a loop at one end and incorporated a removable sliding cutting blade and the option for width extensions. Singercraft Guide No. 2 was much the same as 120987, but had a bulb end. All replaceable parts were numbered. Part/serial number 120983 was the knife guard. The knife was part/serial number 120982. Usable replacement blades are rare these days (and command antiques collector prices), but it's easy to use scissors for cutting rug pile. The width extension part/serial numbers were 120988 and 120989; these allowed the Singercraft guide to be adjusted to 4 different widths. It’s a very simple idea that uses wool from skeins and is similar to the short pile method. With a bit of ingenuity, it is possible to make simple patterned rugs. The Singercraft Guide was the best known of the rug-making accessories for sewing machines, but it was not the only one. There was also the "Limit" and the "Marvel" as well as home-made versions made from thin wood. Because wooden versions were thicker than the metal versions, they had a wider slot to accommodate the sewing foot and produced longer loops. If you can't find a Singercraft, or similar, guide, you can make a similar accessory from metal rulers. 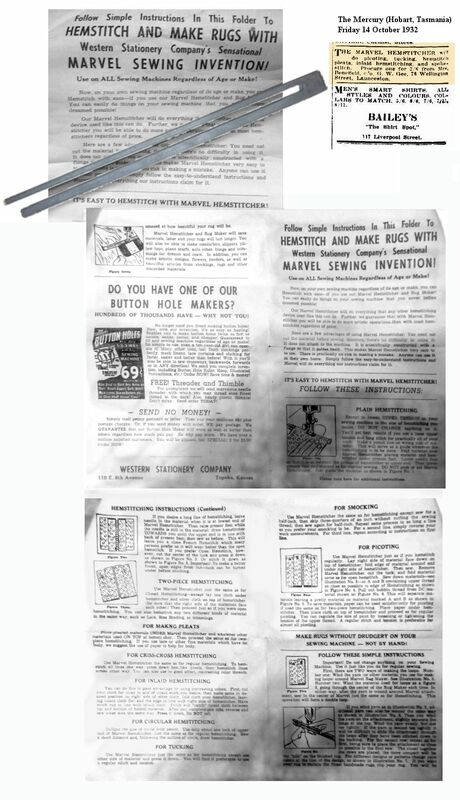 The Marvel Sewing Invention (hemstitcher and rug-making tool) also came with illustrated directions and was described as a simple metal wonder that easily performs plain hemstitching, two-piece hemstitching, pleating, criss-cross hemstitching, smocking, picoting, and more - which included making looped rugs in the same way as the Singercraft guide. This handy aid promised to release the drudgery from stitchery. It performed the same way as the Singercraft Guide and used the same basic method of preparation and simple machine stitching. 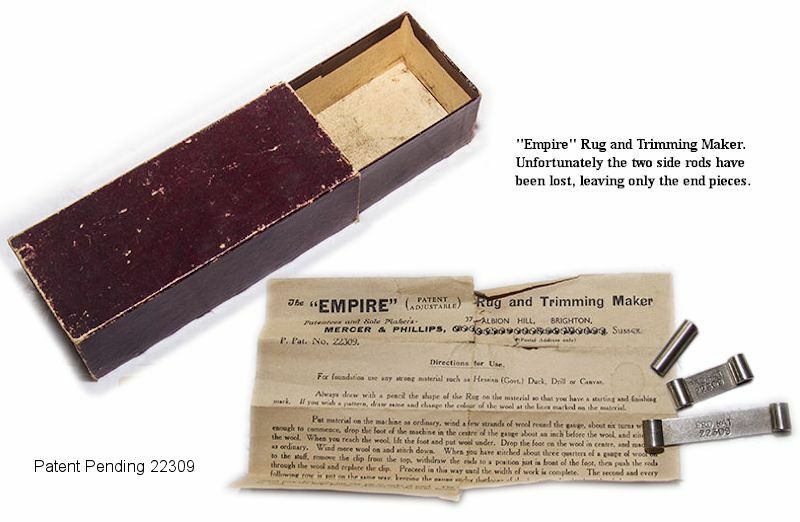 Another rug and trimming making gauge was the “Empire Rug and Trimming Maker” made by Mercer & Phillips of 37, Albion Hill, Brighton, Sussex. This adjustable rug gauge had Patent Pending 22309, but it looks as though this patent wasn’t granted. The operation was similar to the other tools mentioned here. It comprised two rods (which are missing) that were held a fixed distance apart by the metal clips shown.